For the last kitchen for the South Arm Older Adults Community Kitchen before the summer break, we made a Superfoods Salad which was a huge hit during the annual South Arm fund raiser to the food bank. 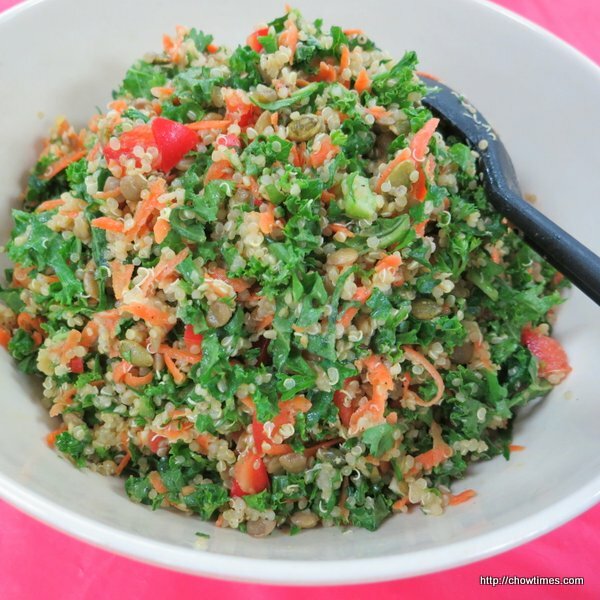 You can find the recipe of the Superfoods Salad here. 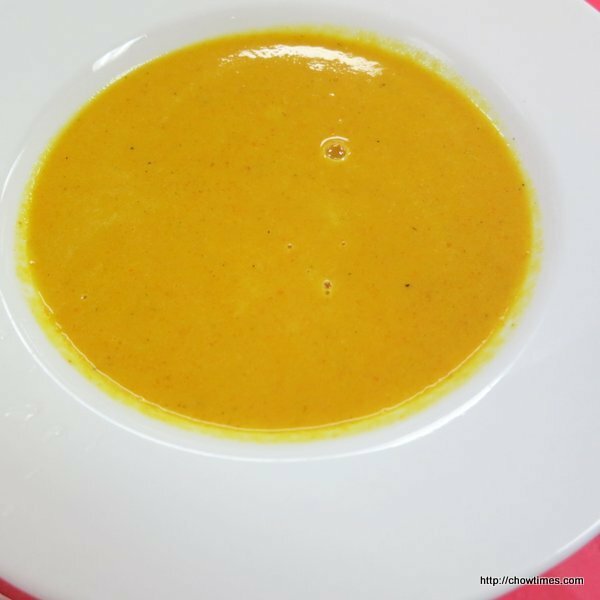 Anne shared a Curried Carrot Soup recipe in this last kitchen. Thank you, Anne for the delicious soup. 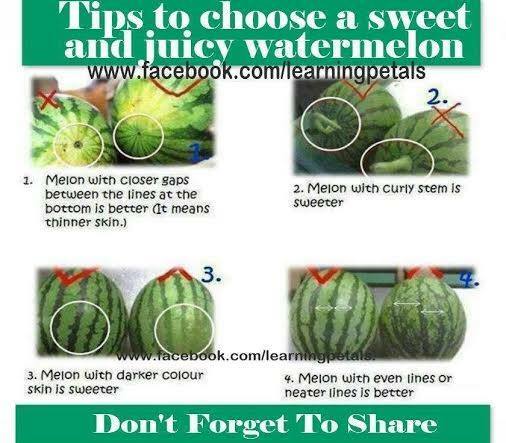 You can substitute coconut oil for the olive oil and butter to add coconut flavour to it. 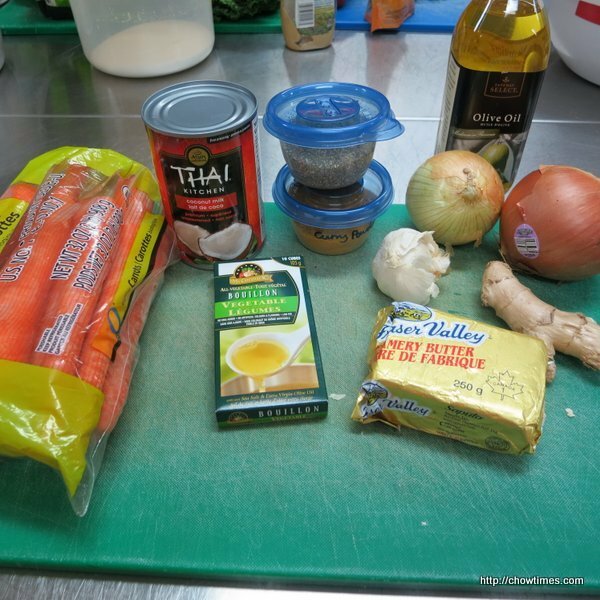 You can also add a full can of 398 ml coconut milk if you desire to tame the spice a bit or you can use a small can of 160 ml for a thicker and spicier soup. After the Scotia Bank Half Marathon, Nanzaro went for lunch by himself. He wanted sushi and found Urban Grill & Urban Sushi on Granville St. He had one of the combo. He can’t recall what it’s called. 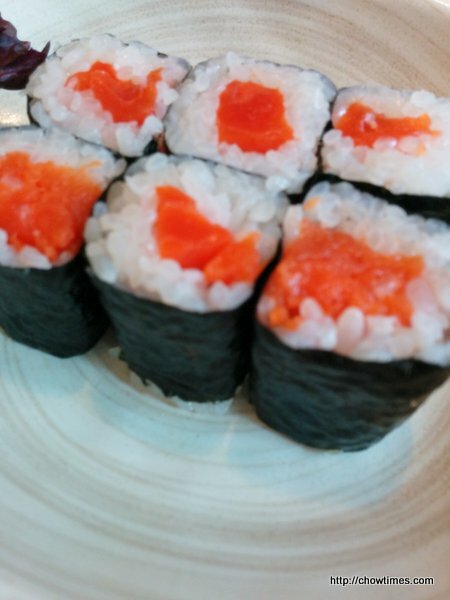 It is made of 2 Tuna Sushi, 2 Salmon Sushi and California Roll. 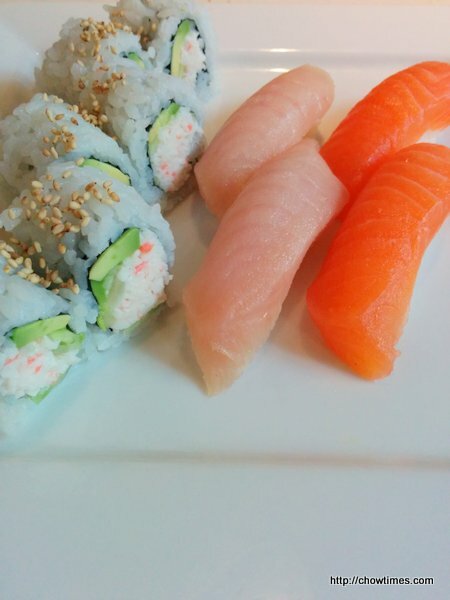 It also comes with a Salmon Maki Roll. 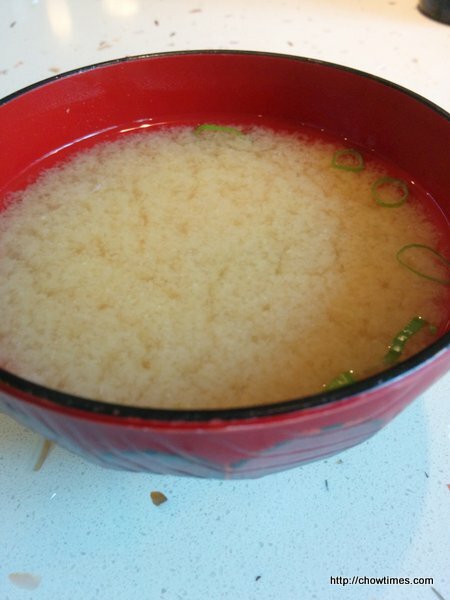 He also ordered a Miso Soup to go with the sushi. 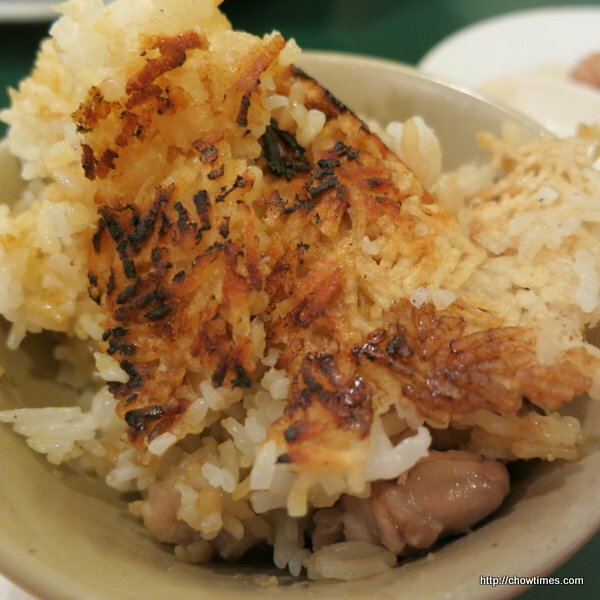 Nanzaro said the sushi is decent and he felt that it is pricey. The bill came to $12 plus. For that price, he can have all you can eat at Ninkazu. Nanzaro needed something light for dinner before his run the next morning. 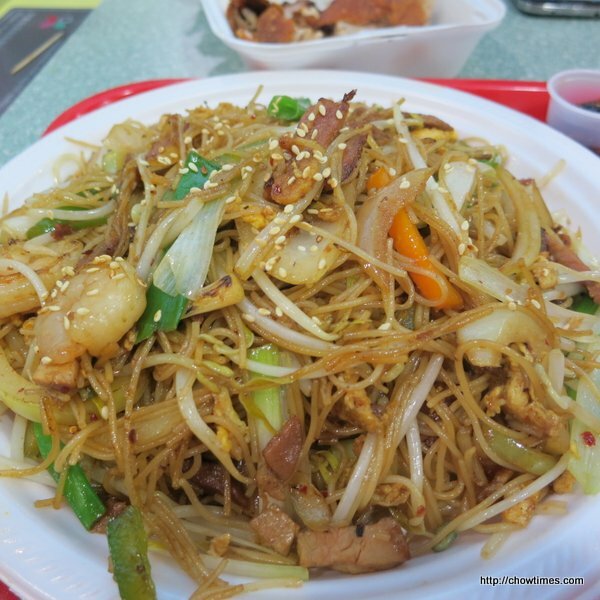 He had carbo-loaded himself with Salted Fish and Chicken Fried Rice from the Richmond Public Market at lunch. We tried our luck at the parking lot where Lido is and luck was with us. The wait for a table was just a few minutes. It must be our lucky day. 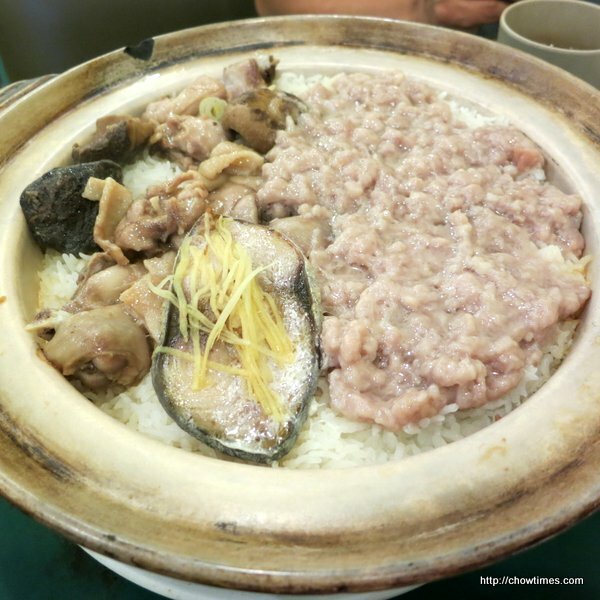 We opted for the large Claypot Rice with a combination of salted fish with minced pork and chicken with mushroom. It was a very large serving; definitely good for at least 3 people. 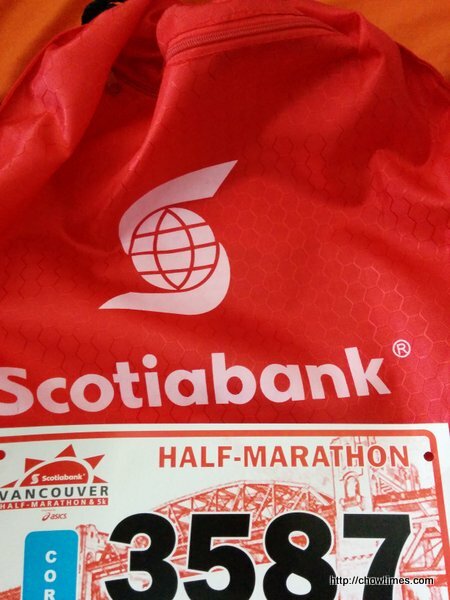 Nanzaro had to go to downtown to pick up his Scotia Bank Half Marathon running kit from the Conventional Center on Friday. The run was on yesterday, Sunday, 22 Jun. This is his second half marathon after his first attempt last year. He enjoys running especially with the company of so many people. 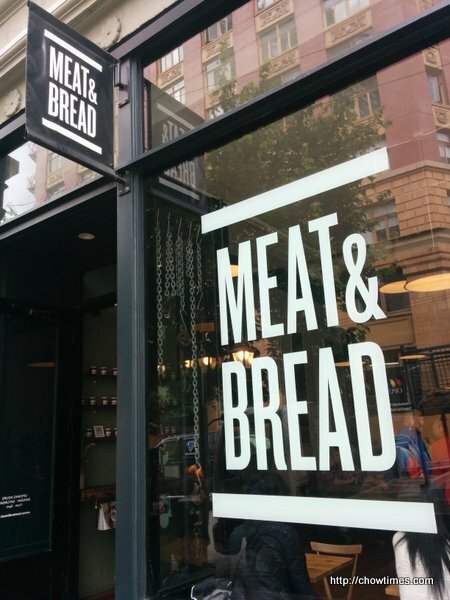 Since he was in downtown, he went for lunch at Meat & Bread in Gastown. 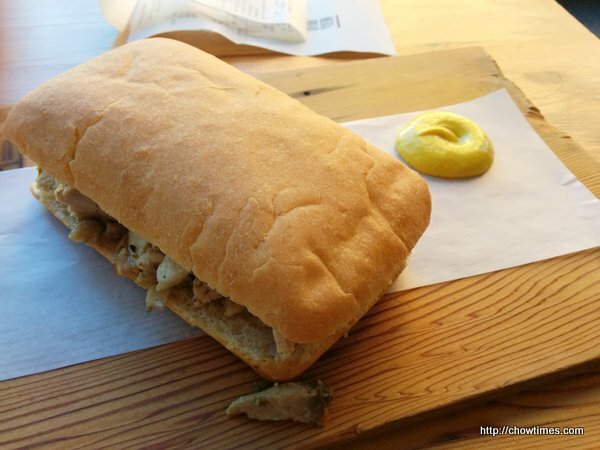 He had tried the popular Porchetta sandwich a while ago and he enjoyed it so much that he wants to return to try their daily special. I met up with Angie of seasaltwithfood.com, Polly and Whitney on a Thursday evening for dinner. It has been a long time since the four of us seen each other. We met in Gastown because Whitney works in the neighbourhood. So, Whitney has the honour to pick the restaurant. 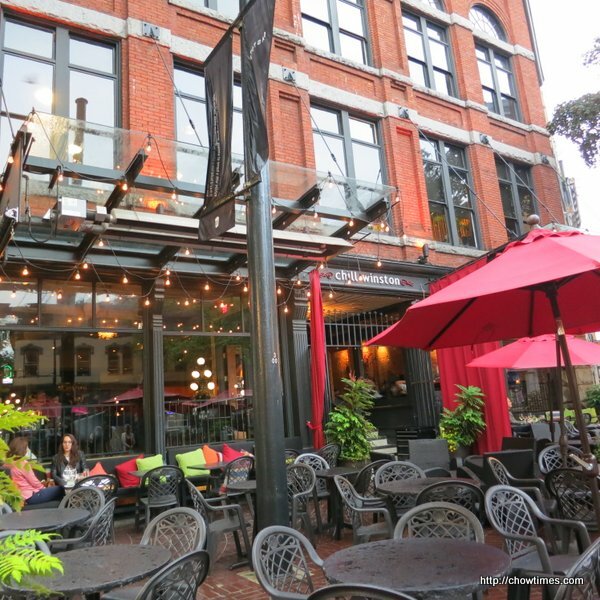 After consulting with her foodie colleague, she suggested Chill Winston for its great patio and its a great place to hang out without being hinted to leave by the server after the meal. The above was the view from our seat by the window. 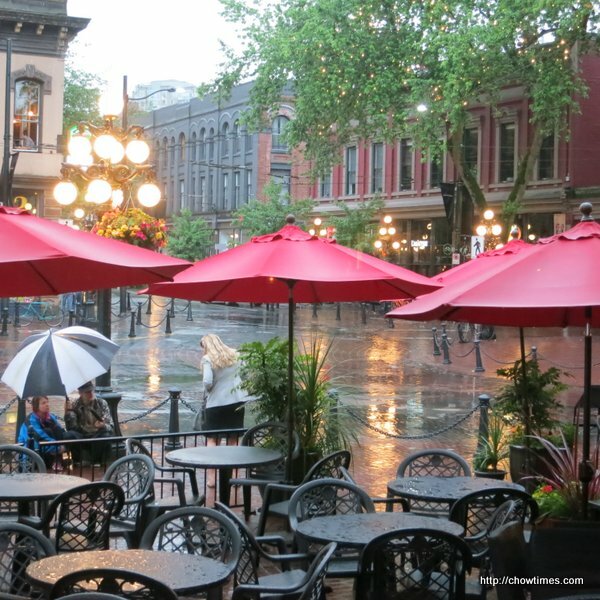 Unfortunately, it was a rainy night and we could not seat at the patio. Polly and Angie had a glass of Rose and Pinot Gris to start with. A 8oz glass is $14.50. Whitney and me are not alcoholic drinkers as our face will look like the Rose above after a few sips. So, we just had H2O. 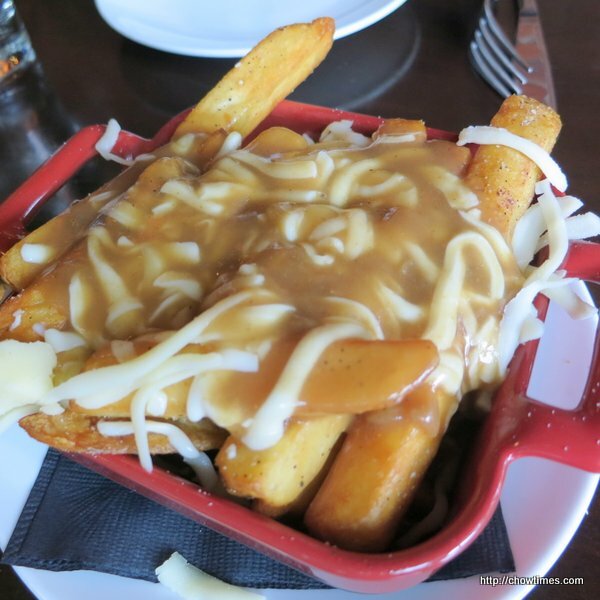 Weekend eating out in June 2014 is limited to the time in between soccer matches. How crazy is your household about the FIFA 2014 World Cup? 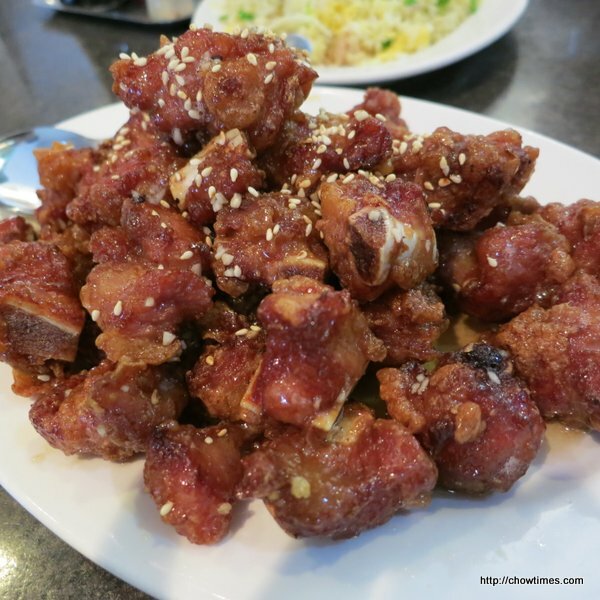 So, for the Father’s Day lunch, Ben decided to go the nearby Specialty Chicken & Wonton House for a quick meal. Since we were there early, there was no wait and we were lucky to find a parking spot right in front of the restaurant. The parking lot at this area is notorious especially in the weekend. Ben took charge of the order since it’s Father’s day. 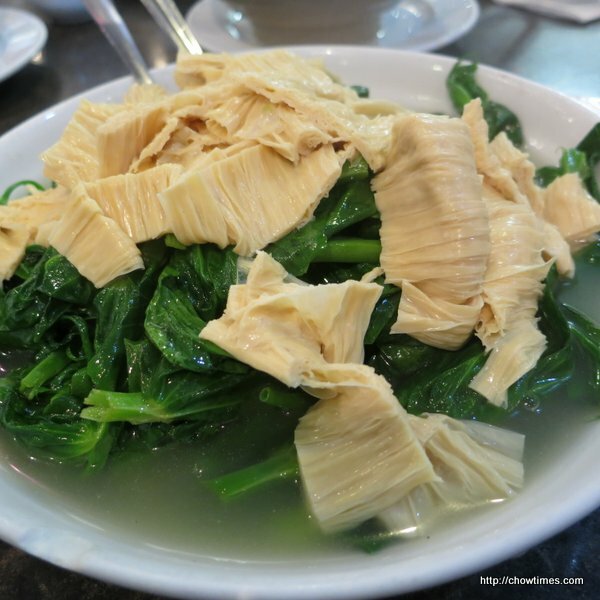 The first dish was his favourite pea tips with fresh bean curd. which came in a broth. It is always pricey to have pea tips and this one was $18.80. Our meal came with a free soup of the day which was not necessary because Ben ordered a soup too. 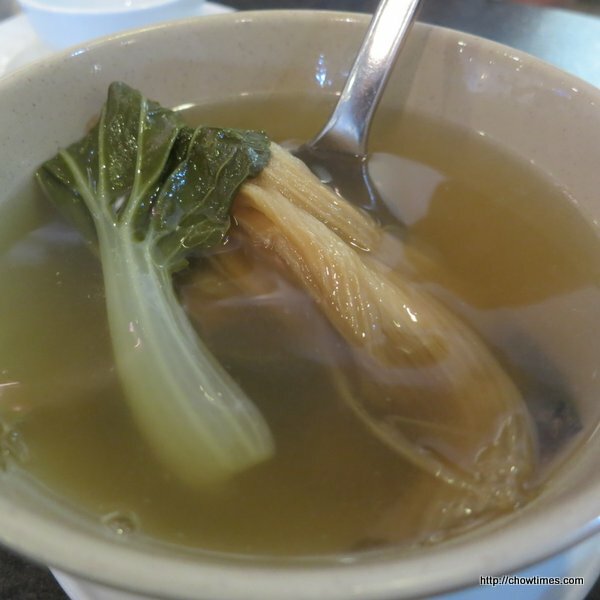 The soup of the day is a vegetable soup made with fresh and preserved bok choy. Ben wanted a savoury breakfast on a Saturday morning. So, we went to Parker Place as there are not many places are opened around 8:00AM. Parker Place foodcourt was almost full even at this early hour. 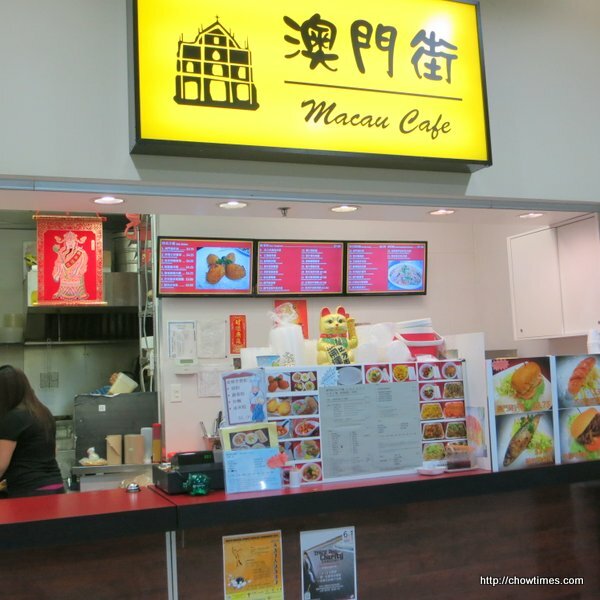 Only three stalls were opened; Macau Cafe, a HongKong style cafe and a Vietnamese stall. 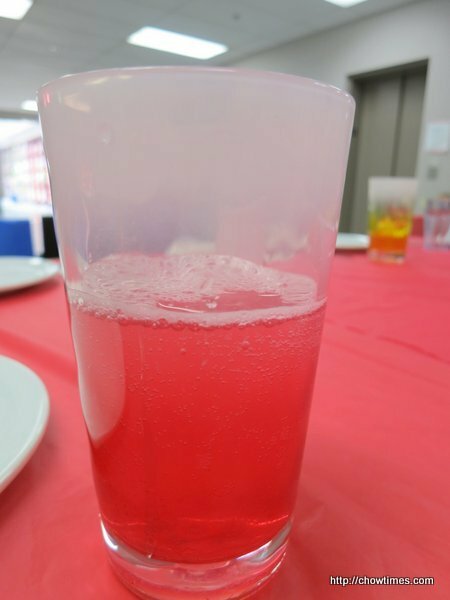 The second rhubarb recipe which Michelle shared in the South Arm Older Adults Cooking Club is a drink. 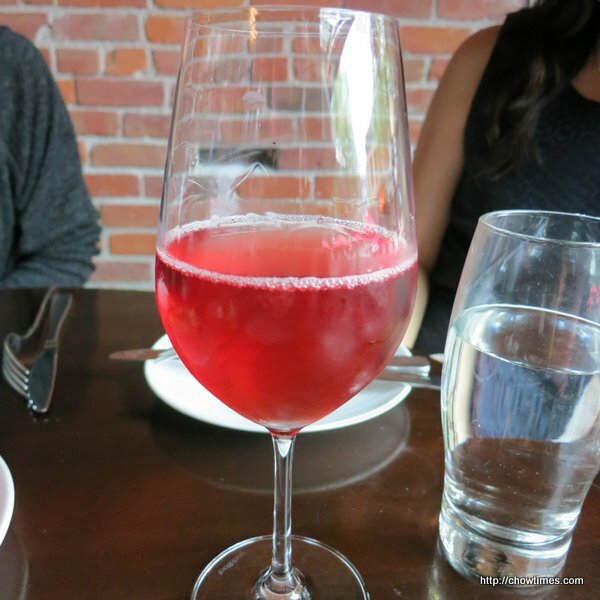 This Rhubarb Soda is a good summer thirst quencher. Rhubarb has a long history of herbal usage. The primary result of rhubarb root as a herbal medicine is a positive and balancing effect upon the digestive system. 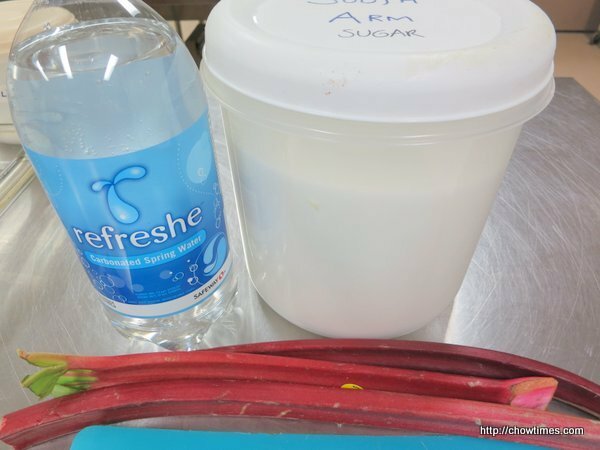 Rhubarb is one of the most widely used herbs in Chinese medicine. Rhubarb roots are harvested in the fall from plants that are at least six years old. The roots are then dried for later use. The root is used as an anticholesterolemic, antiseptic, antipasmodic, antitumor, aperient, astringent, cholagogue, demulcent, diuretic, laxative, purgative, stomachic and tonic. Rhubarb roots contain anthraquinones which have a purgative effect and the tannins and bitters have an effect that is opposite that of an astringent. 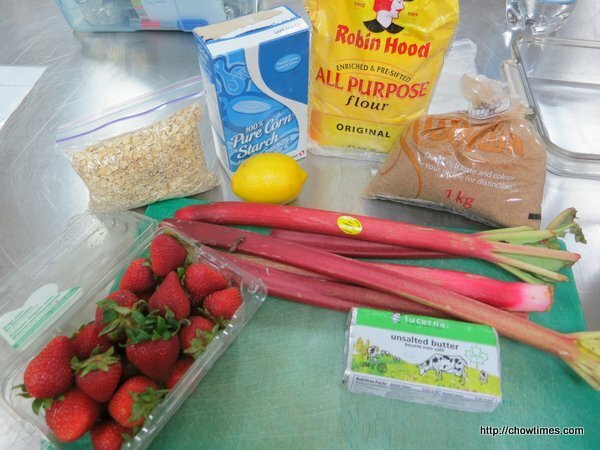 One of the participant of the South Arm Older Adults Cooking Club requested for some rhubarb recipes. 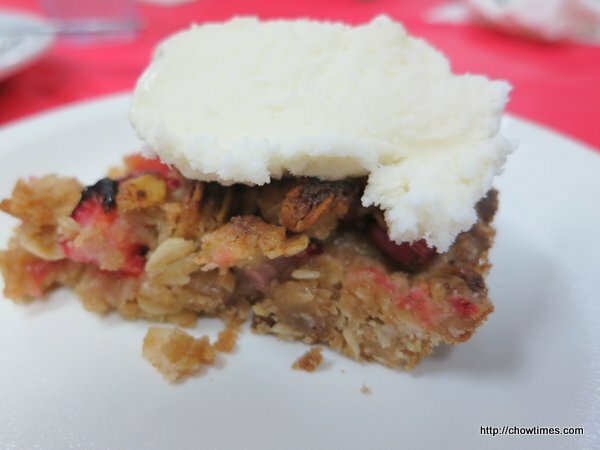 Michelle shared this Strawberry-Rhubarb Crisp Bars which can be prepared all in a pan.